Two men are likely to be facing hefty fines and up to ten years imprisonment after being found with more than 20 times their legal amount of Eastern Rock Lobsters. In a joint operation, the NSW Department of Primary Industries (DPI) Fisheries and NSW Police South Coast District officers intercepted the pair just after 1pm on Thursday 12 July on the Princess Highway in Nowra. DPI A/Director Fisheries Compliance Tony Chen said Fisheries Officers seized a total of 86 lobsters, a cooler box that the lobsters were found in, mobile phones and one of the offenders’ 2014 Range Rover vehicle, worth approximately $80,000. “The possession limit for Eastern Rock Lobsters in NSW is two per person, so these two males had more than 40 times the limit for an individual,” he said. “A total of 48 of these lobsters were found to be undersized, measuring between 6.9cm and 10.1cm carapace length. The minimum size for Eastern Rock Lobsters is 10.4cm carapace length. 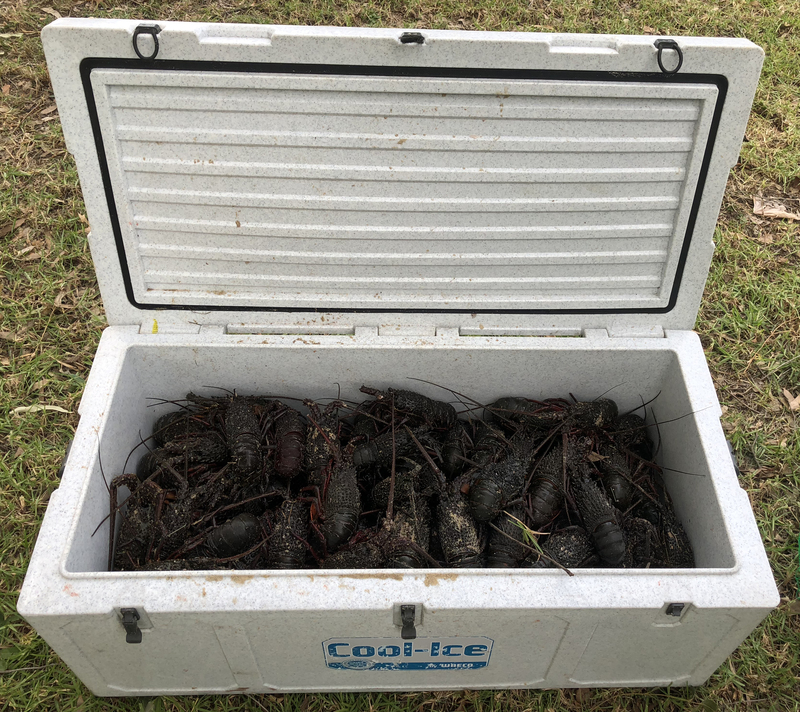 In NSW, it is illegal to sell any recreational caught fish including Eastern Rock Lobsters and is also illegal to buy or sell Eastern Rock Lobsters not legally caught by licensed commercial fishers with NSW DPI lobster tags attached. Mr Chen said the NSW lobster fishery is a highly regulated, share managed quota fishery. “It is a small but valuable industry with a gross value of around $11.5 million. Black marketing undermines the strict management arrangements that aim to maintain a sustainable and viable recreational fishery and commercial industry,” he said. “Trafficking of Eastern Rock Lobsters in NSW is an indictable offence and carries a maximum gaol term of ten years imprisonment. It can also carry an additional financial penalty of up to 10 times the value of the fish. An indictable quantity of Eastern Rock Lobster is 20. Anyone with information on suspected illegal fishing activity is urged to contact their local DPI fisheries office, call the Fisher Watch phone line on 1800 043 536 or report illegal fishing activities online. For more information visit the DPI website.